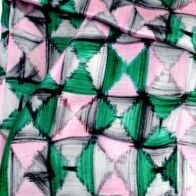 This glossy pure silk scarf, printed in Milan, is based on a graphic design by Kristóf Réti, a young person with autism. When you buy these products you are also serving a good cause by supporting young people with autism and helping to improve their quality of life. This exclusive product is delivered in a gift box, wrapped in tissue paper. Réti Kristóf is our elf drawer, he has already drawn more hundreds of elfes. He is a non-speaker autistic young boy, who is fantastically kind and fills everybody's heart with warmth like his little elfes.